Revealing mistake: When Jude Law needs to pull himself up the flight of stairs to reach the intercom, you can see him use his hips, despite the fact that he is paralyzed from the waist down. Trivia: One of the biggest themes in this film is DNA and how it can be used (and misused) to give information about people. It's interesting that the name 'Gattaca' is spelled using only the letters which stand for the four nucleotide bases which comprise DNA: guanine, adenine, thymine, and cytosine. 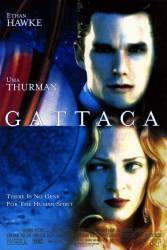 The word GATTACA looks like a short sequence of DNA. Trivia: The staircase in the house of the real Jerome Morrows is actually a resemblance of a DNA structure. Similar to Watson and Crick's model, except for the fact that the staircase has a right-handed turn. The DNA helix is a left-handed turn. Jerome: We have to get drunk immediately. Question: In the scene where Vincent is just about to launch, the doctor testing him mentions his son. My brother seems to think that the doctor knows Vincent is not who he pretends to be because he is Jerome Morrow's father. Is there any evidence for this? Chosen answer: None whatsoever. The doctor seems to have worked out that Vincent is not who he seems to be from simple observational evidence. It's because of his son that he feels sympathy for Vincent and hasn't revealed that he's tricking the system. Question: How exactly does the device that Vincent uses on his legs to make him taller work? Chosen answer: The leg bones are fractured completely across, at a location between the rings of the device. Thereafter, while the bones are knitting back together, the device is periodically adjusted to drag the bones away from each other a fraction of an inch. The bones continue to grow toward each other to close the gap, gradually lengthening. It is an astoundingly painful way to add height. Question: What did Eugene say or do to support his claim in the movie Gattaca? Chosen answer: Please be more specific. To what claim are you referring? The only one I can think of is at the end when he is claiming to be himself. And then he only needed to give his blood and he was done.